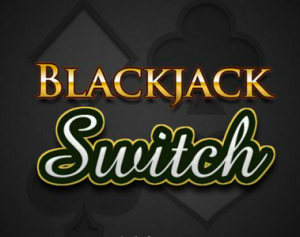 What is Blackjack Switch ? The game commonly known as Blackjack switch is a variant of the traditional blackjack game that affords the player the opportunity to engage in acts that would ordinarily be considered a cheating manoeuver or trading of cards between two hands. What this loosely translates to is that the player is allowed to make two bets of equal sizes and can then switch the second card dealt to each of his hands. Although it is sometimes very risky, in a case where a dealer-22 turns out to be a push against all the non-busted hands, the blackjack pays even money to the player. The specific set of rules that govern the game of Blackjack switch are as follows; Every rule that is obtainable in the original blackjack game is relevant except a few which are always well documented especially to new players. The game uses either six or eight decks and the dealer usually hits a soft 17. The player has to make two bets of equal sizes and all cards must be dealt face up. The dealer will then peek for blackjack usually with an ace or ten up. Where the dealer has a blackjack, all player hands will lose automatically, however, if any player has blackjack, he can push. Now, the player may also want to switch the second card dealt to each hand. E.g. in a case where one hand has 5, 10 and the other has 10, 6, the player can decide to switch the 10 and 6 so that he can have two hands of 11 and 20. He is also allowed to switch cards to form a blackjack. Where the player switched to a blackjack, he gets a total of 21 points and may also double on any 2 cards or after a split. Depending on how the game is shaping up, the player is allowed to re-split up to four hands. Blackjack pays the winning player even money on initial deposits. On the overall, if the dealer has a total of 22, he is able to push against any player that has even as high as 21. However, if a player gets a blackjack, then he beats the dealer even with a total of 22. The Russian Rules Concept is very similar to the one discussed earlier except the fact that early surrender is allowed especially when it is not against an ace. Also the dealer doesn’t take a hole card and he stands on soft 17. There is also the simple switching strategy which is allowed under the Las Vegas rules and is based in order of strength of the listed hands; 21, 20, 19, AA,11,10,9, 18 or 8, 8,8 with 2-8 up. When a player is against a dealer 7 or 8, it is important to balance the hands by ensuring that the weaker hand is as high as possible. The player may also opt to use the scale of hands depicted above for better understanding. When against any other dealer up card, the player must strive to maximize the strength of the higher hand. If you discover that achieving your desired hands in the list is eluding you, it is important to make the strongest hand possible in order of strength from the following; 7 or 17, any hand that should be split, any 12 and any 13. The exceptions include; where there is an A, A + 3 or 8 –, it is advisable to keep the aces together. With A, A + 2, 9 –, you must also keep the aces together especially when the dealer has 2-6 and then with A, A+2, 8 –, the player must again keep the aces together. This strategy is simple when compared to the optimal strategy although the percentage error is quite negligible at about 0.17. This means that an error is expected to occur once every 18.6 hands if this strategy is adopted. Advanced switching Strategy is in line with the Cindy Liu Advanced Switching Strategy which is also allowed under the Las Vegas rules. To make this plot work for you, you must add up each point for each hand for both ways to play them. Also ensure that the hand with the greater number of points is prioritized. In the case of a tie, the simple strategy earlier discussed should be adopted. 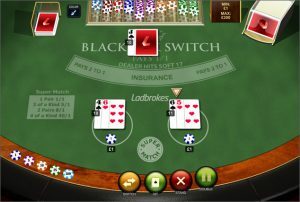 Another switching strategy is the Arnold Snyder Switching Strategy developed by Arnold Snyder which is a very easy but effective way of switching in the Blackjack switch game. The percentage error is slightly higher than the previously discussed one at 0.2. Another strategy is if you use the switching calculator developed by Jing Ding. This strategy suggests to players when it is the best time to switch. It is also based on an infinite deck assumption and Playtech rules. House Edge: As per the Las Vegas rules where six decks are used, the dealer usually hits a soft 17 and a switched blackjack will count as 21 points. The house edge is 0.58% if optimal strategy is adopted although there are some variations like: Eight decks: +0.02%, Switched blackjack automatically wins:-0.40%, Blackjack automatic winner: -0.21% and Dealer stands on soft 17: -0.30%. Under the Russian rules, the house edge is 0.20% given that early surrender against an ace is permitted. Get up to a 100% on your initial deposit up to the 150 GBP limit at William Hill Casino. Ladbrokes Casino bonus: First 3 Deposits up to £1,500. First Deposit: 100% match bonus or 150% from the installed app up to £500. 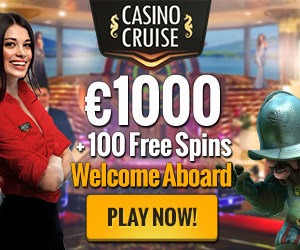 Get your exclusive 100% up to 400€ +7 Reload Bonuses from Casino.com online casino. Make a deposit and receive your €3,200 welcome bonus!